Walkers wanting a close up view of the Yorkshire Dales' hottest chicks need to act quickly. 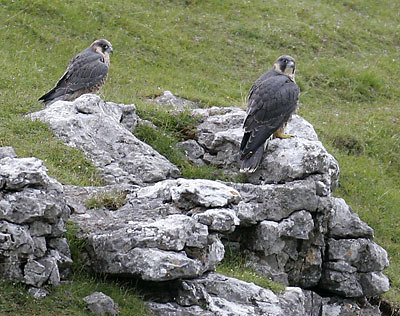 Malham's Falcon Watch – set up to give visitors a fascinating view of a family of peregrines nesting on the famous cove, ends on 12 August. The project has seen an astounding 22 000 people use the specially set up point, complete with telescopes, since its start in April. The bonus addition of two chicks born to the pair of raptors has seen visitor numbers pass last year's, the first time the scheme was run. The parents have been named Clint and Gryke after the terms used to describe the blocks and channels in the area's limestone pavement. A team from the Royal Society for the Protection of Birds (RSPB) and the Yorkshire Dales National Park is running the Falcon Watch each day from 10.30am to 4.40pm. National Park wildlife conservation officer Ian Court said: “The birth of the chicks has been particularly pleasing and they have been a marvellous spectacle as they hone their flying and hunting skills round the cove. David Hirst of the RSPB's Northern England Region, said: "The peregrine family is putting on a fantastic air show at Malham Cove at the moment and so this is a great time to go and see these superb birds. “Seeing close-up views of the falcons through the telescopes at the watch point and having the benefit of the expert local knowledge of the RSPB and Yorkshire Dales National Park team really adds to the experience of a visit to Malham." Malham Cove is one of the Yorkshire Dales' most spectacular crags, an 80-metre high, 300-metre wide sweep of carboniferous limestone which is a mecca for climbers. 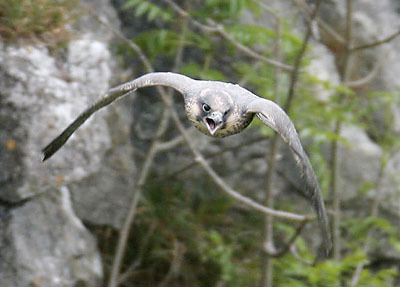 The British Mountaineering Council operates a voluntary ban on bolting in the area around the peregrines' nest until the birds are fully fledged. This was lifted a month ago. The peregrine is the world's fastest animal, having been recorded at 350km/h (217mph in old money) as they intercept prey in an aerial dive. Numbers are now on the increase after pesticides devastated the population in the 1960s. There are about 20 pairs in the Yorkshire Dales and around 1 300 breeding pairs nationally. The Falcon Watch at Malham is one of a number of free programmes run by the RSPB to encourage the public to get a close-up view of some of the country's most exciting birds.